Five years ago this month, I decided to run my first race. That idea leapt into my head in Boston. Let me set the scene by relating my latest run. Today's run measured a more bite sized 8.5. Departing from my hotel in Kendall Square, I headed west next to Memorial Drive. I passed the Mass Ave bridge, waved hello to my college dormitory, swept past the old Polaroid headquarters and continued on to Harvard. 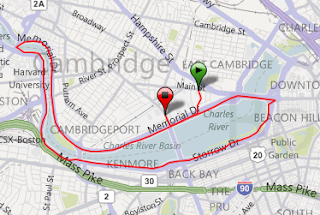 There, I turned left onto and over the Harvard St. Bridge, and then another left to head back east. This side borders Storrow Dr. I past through BU and then around the Half-Shell. I took the bridge back towards Kendall Square, the Red Line T trains rattling past as I crested the incline up and over the river. I rejoined the Memorial Drive bike path back to Mass Ave, turning right and finishing at 77 Mass Ave, MIT's front door. I then walked down the Infinite Corridor as my post-run cool down and a chance to enjoy being on campus. Yet I made one stop during those 76 minutes. You see, the birth of my running races occurred almost exactly five years ago on the Boston side of this same track. That seemed like a worthwhile event to commemorate with a few photos. So many of my ways of thinking developed in my years at MIT that I find the notion refreshing that my racing career started here too. a change in diet had proved successful in shedding some pounds, only an addition of exercise would fully help me maintain good cholesterol levels and long term health. My genetics do not bode well with heart disease, so my defense requires multiple preventative treatments. A friend in HR suggested I try running, and despite my misgivings that my knees could not take it, I laced up and tried it. I barely could go half a mile. Yet, I persisted and built up over the next few months to a couple of miles each time out the door. orld of Sports at the multitudes crossing the Verrazano Narrows Bridge to start the New York City Marathon. Yet, I did not connect those events and myself. One reason I could even start running in February 2006 related to my stepson Justin who factors into this month's anniversary as well. Justin developed a passion for outdoor activities like rock climbing and hiking. His high school offered a chance to spend a semester at a program high in the Rocky Mountains in Leadville, CO. Elevation: 10,000 feet above sea level. With Justin out of town starting in late January, I no longer needed to take him to school before I went to work. And I knew when he got home that he would obtain his driver's license. So, my morning carpool days ended for good when Justin departed. body. Justin asks if he can go with me on the , and of course I eagerly agree. We run down Mass Ave and turn right at the bike path. Our goal that day consisted of just a lap to BU and back. Heading west, we cross over the BU bridge to Boston. Another left and Storrow Drive slides under our feet. At about the half-way mark, all of sudden something happens. with each other in that way. In fact, I would say we both have a much stronger desire to collaborate and share. Yet all of a sudden, I start wondering about my running abilities. Had we even run 1.5 miles? How could a nearly 40 year old be in better shape than a mid-teen with more miles under his belt - and miles in very thin air up in the mountains? Could I actually be good at running? That little piece of pavement in Boston changed my thinking about my running. I gained confidence immediately in my abilities. And I don't know why, but I wondered if I could run a 5k. I knew the Palisades Will Rogers race was that upcoming weekend on July 4. I did not know if they would take a registration that late (but I found out with a quick web search that they did). That short run and then walk changed my view of myself and inspired me to try something new. 14 marathons later, I am still appreciative of this new found passion. And to be fair to Justin, we did resume running shortly after we stopped and made it all the way back to the hotel. Would I have tried racing eventually? I am fairly sure I would have. But regardless of perhaps an eventuality, the origin of my racing story all began on a warm June morning along the backs of the Charles River. Five years ago this month. Thanks Joce! Hope you had a great run. I don't know BostonFit, but maybe I should look them up if I am ever there over a weekend and want to find a group for a long run.